The new Zonda Model is the fastest,the strongest,most exclusive and most expensive convertible sports car in the world,said Horacio Pagani about his last creation. Safety is the only rule Zonda R accepts because liberty is the word that fully characterises this car,as it's target is the ultimate performance at the racetrack without any implications of rules. The engine is built by the racing specialists at Mercedes AMG,where the championship winning DTM cars are born,as well as the CLK GTR,probably the most devastating and effective weapon ever to compete in the GT series. From it's engine the Zonda R borrows the basic architecture including an ingenious dry sump allowing a low centre of gravity. This self-supporting engine with 750 hp at 8000 rpm and 710 Nm of torque carries a lightweight carbon fibre high-performance intake system,a racing multiple disc sintered clutch and Formula 1 style exhaust system,hydroformed in Inconel 625 and ceramic coated for optimal heat dissipation. Most certainly the power unit combined with a 6 speed transversal manual sequential synchronised gearbox will satisfy the most ambitious drivers. The central carbon chassis will incorporate a roll cage and a rubber racing fuel tank with 4 fuel pumps and quick refuel filler like on GT race cars. Best stability is provided by the wheelbase has been increased by 47mm. The front and rear subframes are brand-new,built to accommodate a new suspension geometry,produced in avional. The magnesium forged rims with central wheel nut and a quick pneumatic lifting system allows fast and effortless changes of the slick tyres.The new bodywork has been honed to offer elevated downforce even in low speed corners. The longer front bonnet with flaps,closed underbody and the rear overhang with the adjustable rear wing and race derived diffuser translate into shattering aerodynamic efficiency and will let you experience cornering speeds beyond imagination.The interior is designed to accommodate the driver and passenger in bespoke seats,built to offer the best support,when the G-forces from the vehicle dynamics come into question.The Digitek instrumentation provides the essential information and a sophisticated telemetry allows through a variety of sensors to monitor every single component of the carEven though it was built for the track,if the quality and finish of the car and its details werenot up to the level of the Pagani road cars,the project would not have received a kick off. 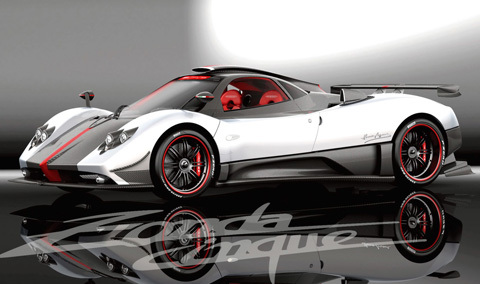 The Pagani customers who have ordered the Zonda R will be relieved of almost 1.2 million. Ah, supercars. They truly belong in a world of their own. They command respect and admiration from every car enthusiast, and for most guys they are just one of those things that you simply cannot have. But we do have our own little dreams, and if dreaming about superfast cars is your thing, so be it. The Pagani legacy has been re-defined by its latest offering, the 2011 Pagani Huayra. In honor of the National Aerobatic Team, Frecce Tricolori, who is celebrating their 50th anniversary, Horacio Pagani unveiled his latest masterpiece, the 2010 Pagani Zonda Tricolore, as a tribute to this nine-plus-one demonstration team of the Italian Air Force. The team is based at Rivolto Air Force Base in the province of Udine. Pagani, the Italian super car that relies on Mercedes Benz' power plant manufacturing has recently released another brand new roadster Zonda R version. The introduction of the Pagani Zonda Cinque Roadster to the market is well-received, and similar to its coupe sister, Pagani only produced 5 units and was sold at a 1.3 million Euro price tag ($1.85 million). Pagani's latest version of the Zonda, named the Cinque, is a street legal version of the race-only Zonda R and it will price at $1,240,000. Power comes from the same 7.3-liter V12, although it has been detuned to 678 horsepower, down from Zonda R's 750. The Cinque will also feature a full carbon fiber body, massive Brembo brakes, a six-speed sequential gearbox, and Pirelli PZero tires. The new Zonda Model is the fastest, the strongest, most exclusive and most expensive convertible sports car in the world, said Horacio Pagani about his last creation. Safety is the only rule Zonda R accepts because liberty is the word that fully characterises this car, as it's target is the ultimate performance at the racetrack without any implications of rules.